Mary Johnson was born in the small farming community of Hillsboro, Kansas. Growing up on a farm, Mary had many opportunities to experience the art of nature in its purest form. Watching the sky turn colors as the sun set was, and still is, one of her favorite things to draw inspiration from. 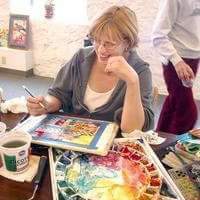 Mary studied art through high school and college, and has taken many art workshops from such artists as Hugh Greer, Susan Blackwood, and Karen Knutson to name a few. Mary has also taught several workshops on collage and watercolor in Newton and Topeka. Johnson has shown her art at Mead Street Gallery (where she was featured artist), Tessera Art gallery, and Gallery XII, all in Wichita, Kansas. Mary is also an artist member of the Carriage Factory Art Gallery in Newton, Kansas, where her art is displayed.